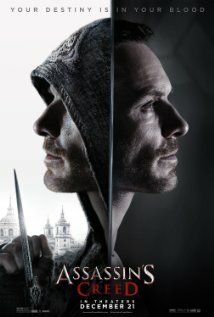 I should start by saying that I have never played any of the video games in the Assassin's Creed franchise, which are what this film is based on. A friend of mine who saw the movie with me has played the games and said the movie was totally different, but that is all I have to go on. I liked the action and there was plenty of it. For some scenes, we follow Cal Lynch/ Aguilar (Michael Fassbender) through ancient memories of his ancestor recreated by a strange machine. He is one of the last living descendants of a brotherhood of assassins tasked with protecting an ancient artifact from a group called the Templars that want to use it to destroy free will. At first, Cal is hesitant, but after he experiences many moments through the machine, he acquires the abilities of an assassin and becomes the greatest parkour athlete in existence. He soon realizes that protecting the artifact from the Templars is a top priority, and also discovers he isn't the only assassin left. The person who created the technology to revisit memories in the past is Sofia (Marion Cortillard) and she is a very hard worker who has achieved many goals. Unlike her father Rikkin (Jeremy Irons) she has a heart and likes to do things with a caring attitude. Her father, on the other hand, wants to push Cal to his limits without regard for his health. But when you push someone too hard it can unleash a beast that is not meant to be unleashed. This flick was full of action but the story had me confused. I left with a big question going through my mind: how does the artifact actually get rid of free will? It just made no sense to me. No disrespect to the gamers who might end up loving this one, but all I left liking were the action and visual effects. The story was confusing, but maybe I just need to see it again or play the games.